[Blind Gossip] She is a very successful movie actress. Her husband found her diary. Yes, he read it. He found her old diary. She had an affair with [co-star] while they were doing [movie]. He had suspected it before, but when he asked her about it, she said no, it was just a rumor, so he let it drop. Now he knows she was lying. We didn’t think their chemistry during their movie was that convincing, so it is at least a little bit interesting that they were getting it on in real life! Supposedly, the husband has not confronted our actress yet. That’s bound to make for one awkward (and not very funny) dinner conversation! [Optional] Should the husband bring it up or let it go? Doubling down on Carell and Anne Hathaway. Margot Robbie and Alexander Skarsgard during Sundance while she was still engaged? Given the reference to “not very funny” dinner conversation, wouldn’t that hint the parties involved were together in a comedy, or the woman is known for being funny? That would rule out Cotillard/Pitt, Hathaway/Bale, Chastain/Isaac, Robbie/Smith, and any other pairs who starred in a drama. Well, at least now he knows, I guess that’s the price he paid for reading someone else’s private diary. No idea, so I’m gonna shoot in the dark and say Margot Robbie and Leo DiCaprio, The Wolf of Wall Street. This! 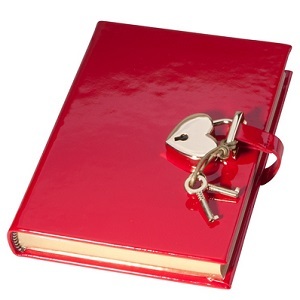 Red diary = la vie en rose! Could this somehow involve Steve Carell? There’s “In Real Life” (Dan in Real Life) and “dinner conversation” (Dinner for Schmucks)? Groff has been out of the closet publicly since 2009. They have been close buddies since Matt was 12 and i can imagine Matt keeping diaries and Luciana reading them. They went really wild in their early success years and talk of a sexual relationship has always bubbled under. um, I’m guessing you posted this on the wrong blind, bc the diary-writer here is a woman. amy schumer and bill hader.? he just recently got divorced, maybe this is the sad reason. would also fit with the “funny” clue. But I think of Kristen Bell’s fame as more TV-based than film. Anne Hathaway and Christian Bale in the Dark Knight Rises? I do think her and Brad had an affair, though. Julia Roberts + any one of her former costars – she has about as much on screen chemistry with any of them as a sack of wet mice.